Here is the list of Best Free RAR Password Unlocker Software for Windows. These software run different processes to recover password of locked RAR files. Some of these also let you recover password of ZIP files and other files as well. The most common methods used to unlock RAR password are Brute-Force Attack and Dictionary attack. Brute-Force attack method lets you define minimum and maximum password length to search for password. You can also set parameters if you want to include upper or lower case alphabets, special symbols, space, and numbers to search for password. Dictionary attack looks for password match based on words included in a dictionary. A dictionary can be a set of random keywords. You can download a dictionary from internet or make your own set of keywords to unlock RAR files. There are several other methods which you will get to know, used by the mentioned RAR password unlocker software. These methods can be used based on the password that may have been set. You will get to know about these software and also know how to unlock RAR files using these software. Some of these RAR unlocker software come with limitation, and only let you view limited password digits of unlocked RAR files. The software with Masking option are the best, as they can display the whole password if you know a part of the password. For example, if you know the first three letters of a password, then you can apply them as mask. In this case, the software will display the rest of the recovered characters of the password, without hiding them, up to the limit of respective RAR password unlocker. Free RAR Password Unlocker is one of my favorite tool to unlock RAR. It not only lets you unlock RAR, but ZIP and 7ZIP files as well. Use masked and unmasked Brute-Force attack and Dictionary attack to recover RAR password. Also, it is a RAR password unlocker software with no limitations. 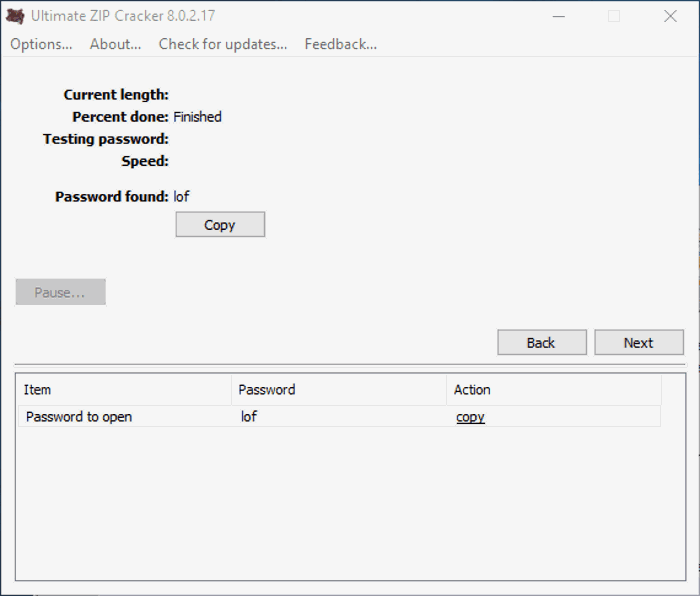 Free RAR Password Unlocker has options to unlock RAR password and other archive files, such as ZIP and 7ZIP files. You can carry out masked or unmasked Brute-Force Attack method or Dictionary method to recover RAR password. You can choose the attack methods based on the password set. If you select Brute Force method, you can set a range of alphabets, digits, symbols, space, etc. Now a Mask (pattern) can be set as well, if you partially remember the password. Dictionary method comes handy if you think password is a dictionary word. This is the fastest method and helps you with recovering RAR password if a keyword is your password. Default dictionary or a dictionary downloaded from internet can be selected to look for password. This RAR unlocker software can look for numeric, alphanumeric, and alphabetic passwords. Also it has no limitation on the number of password characters. While running the password trials, it displays the password being checked and the number of checked passwords, and the elapsed time. Brief Scan: Using this method, the software searches among the most common passwords. Brute-Force attack: Search for password by defining password length, applying filer for numbers, upper case and lower case letters, special symbols, etc. Dictionary: Use a default dictionary to search from a set of keywords. Phonetic attack: Uses different combinations of keywords in mixed upper case and lower case. Date Search: Searches a large number of date combinations for password. Free Type Validator: Matches passwords based on manual entry. Customized search: With this, you can recover structured passwords, like web address or if u remember a fixed part of a password, like a name. Thread processing can be set to low, normal, high, or highest. Its a free version and displays passwords up to 4 characters only. So, if the rar file has a short password, this software can be used. Otherwise, you will need to purchase the full version of this software. 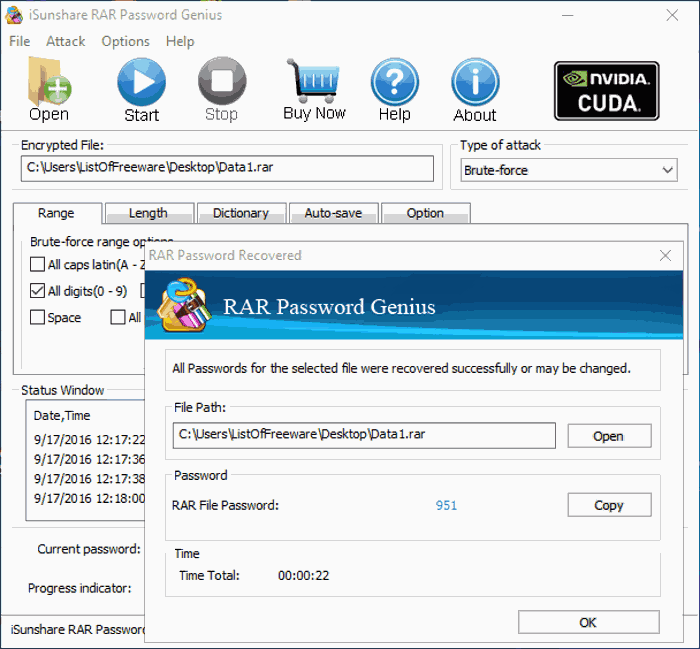 RAR Password Genius provides an interactive interface to unlock RAR password using several unlock methods. The unlock methods, also known as attack methods which you can choose from, are: Brute-force, Mask, Dictionary, and Smart. After selecting a method, you need to define several parameters (based on the method selected) to carry out the attack. Maximum and minimum lengths of passwords to look for can be set. Character filter for lowercase letters, uppercase letters, numbers, space, and special symbols can be set. When you choose a RAR file to unlock, it gets saved as a project. You can auto save projects every defined minutes. Want to set a high priority to unlock RAR password? You can do so or simply let the software run in background. Enable Log option to log the activity of the unlocker. If there are only 3 characters in your password, then there’s no issue. As this is a trial version, you can only view the first 3 characters of extracted password. Buy the full version for unlimited features. 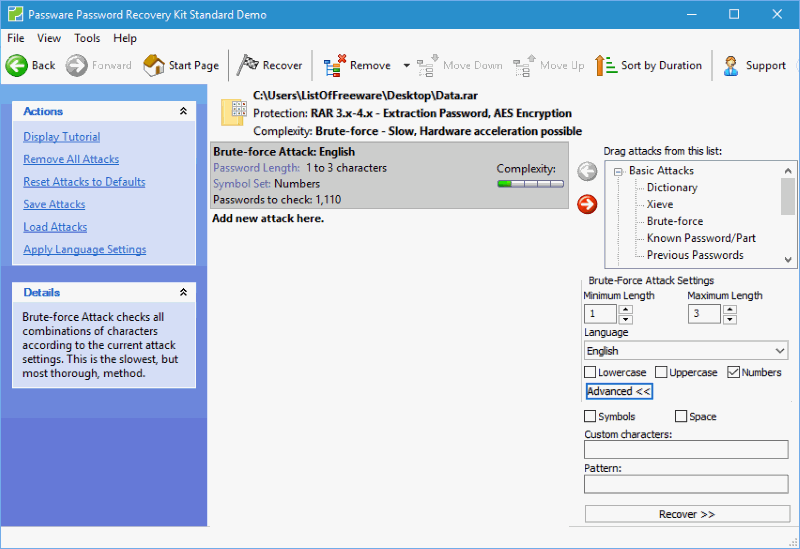 Passware Password Recovery Kit Standard is a file password recovery tool, which can be used to unlock RAR files. It not only lets you recover file passwords, but also lets you find encrypted files and reset Windows administration password. A wizard helps you to find out password. Options available let you search in one dictionary, more than one dictionary, non-dictionary but similar to dictionary words, or if you know nothing about the password. To make it easy for the software to find password, filters can be set for password length, letter case, symbols, space, or pattern. It follows Brute-Force attack method to find password. The free version has a limit to display only the first three letters of the password, also it runs the search for just 1 minute. 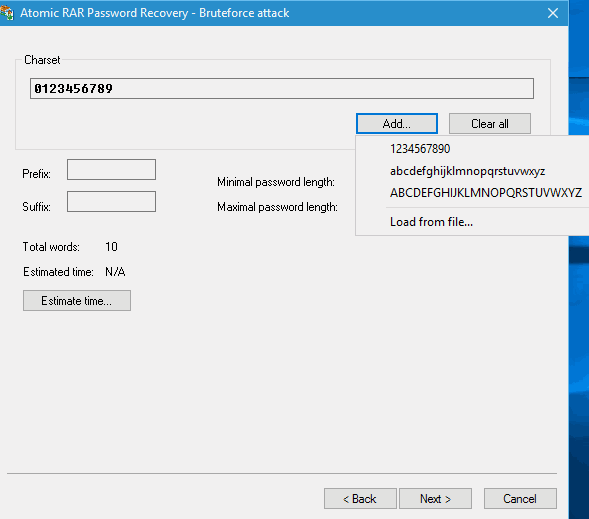 Atomic RAR Password Recovery lets you recover RAR password under projects. You can either use Brute-Force attack method or Dictionary search method. Add a prefix or suffix if you have any idea of the password. You can also set minimum and maximum password length for better search. Add filter to define character set and character case to further narrow down search. For dictionary, you can manually add dictionary to search from a set of keywords. Begin the search and the result will be saved in .rpc format. Like most of the the RAR password unlocker software, it also has a limitation to display just 3 characters of the password. Free RAR Password Recovery is another RAR password unlocker software which provides 3 different methods to unlock RAR files. The free version only lets you use one method to unlock, that is the Brute-Force method. The other two methods (Mask and Dictionary) can only be used if you use the PRO version. Apply filter to select character case, space, digits, and other symbols. If you have any idea, you can also set the minimum length of password to make the process quicker. WinRAR Password Cracker lets you unlock RAR password using two recovery methods. You can either choose Brute-Force method or Dictionary method to carry out RAR password recovery. You can unlock RAR as well as unlock ZIP files with this freeware. For Brute-Force attack method, you can set password length, character set (digits, uppercase, lowercase, special symbols, etc.). Set dictionary file path and start line for running Dictionary method to unlock RAR.